The cellophane wrapping machine is general equipment to make 3d packing for different specifications carton or hard side body objects. 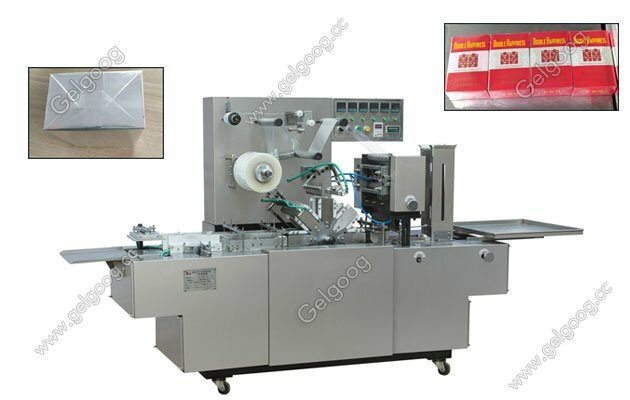 Automatic Cellophane Overwrapping Machine for Medicine Box GGB-200A This Automatic Cellophane Overwrapping Machine’s applicable material is cellophane and BOPP coating film, and this machine is general equipment to make 3d packing for different specifications carton or hard side body objects. Its regards mechanical linkage as the main body, adopts stepless frequency control of motor speed and automatic control electrical accessories. 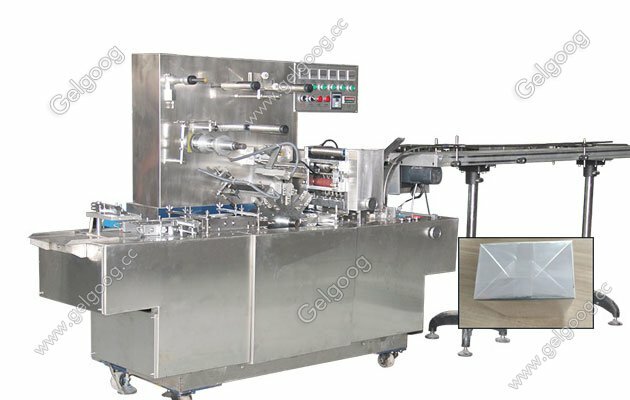 The cellophane packing machine integrating machine, electricity and gas as a whole, has compact structure, beautiful performance, convenient operation and easily maintenance, small volume, light weight and high degree of automation, etc. advantages. GGB-200 Cellophane 3d Paper Box Packaging Machine ulterize hoppers and conveyor system to supply packing product, finish product packing by though film supply, cut film, folding, packet, heat sealing, reshaping, outlet etc. process. After folding of both sides, using adhesive sealing means to achieve sealing, moisture proof, decorating packaging effect. Transparent film and opening line printed with a graphic or holographic laser logo (commonly known as the gold drawing line, unsealed line), after the adhesion of adhesive paste, this machine can get easily opening and anti-counterfeiting effect. (1) Transparent Cellophane: can be heat sealed, moisture-proof, 300# ~ 600#. (2) BOPP film: thickness 2.2c ~ 3.0c. (3) Unsealed line: width 1.2 ~ 3mm different colors adhesive sticker. (4) Specifications: transparent lines, a single gold, full of gold, bright gold, transparent red, white red, white gold,Laser anti-counterfeit, laser hollow and so on. Video of automatic cellophane wrapping machine working video.Leave message if you need the automatic cellophane wrapping machine quotation. For the cellophane wrapping machine,our company based on the existing technology, the introduction of the latest international certificate concepts and advanced technology, develop more sophisticated technology and equipment to meet different user requirements. Dedicated to providing customers with tailor-made equipment, starting from the customer's needs to explore new ideas, and guide the research and observation updates, product design. A number of senior engineer as the core engineering design team. Based on the company, existing core and key technologies, from the production planning to commissioning, maintenance and repair to product technology upgrades, individual issues from stand-alone to the integration of the entire line of equipment to provide qualified, technologically advanced and personalized packaging Equipment and automatic packaging line.